I've just popped into the oven a Birds Eye cod fillet - very tasty by the way. And to keep me safe, Captain Birds Eye decided to pop a little warning on the back of the packet. I don't have a problem with Birds Eye for putting such a ridiculous warning on their packet, I blame the culture that makes them feel that they have to. But I can quite see why they did. Obviously there's a need to tell people what ingredients have been used, so that they can avoid allergens. And therefore stop them from suing the Captain and having him thrown in the brig. But we already have something that does this - it's called a list of ingredients. They've tried to make it easier for people by highlighting common allergens, but the trouble is in the world, there will be someone allergic to the thing that you make. Off the top of my head, I can think of people allergic or intolerant to milk, wheat, nuts, garlic, and water. Yes, water. So, as much as I understand the intent behind warning me that my fish fillet contains fish, it is a little bit overkill. It would be much more helpful if I had something that warned me of the contents of my son's nappy. Hang on, I do - a nose. 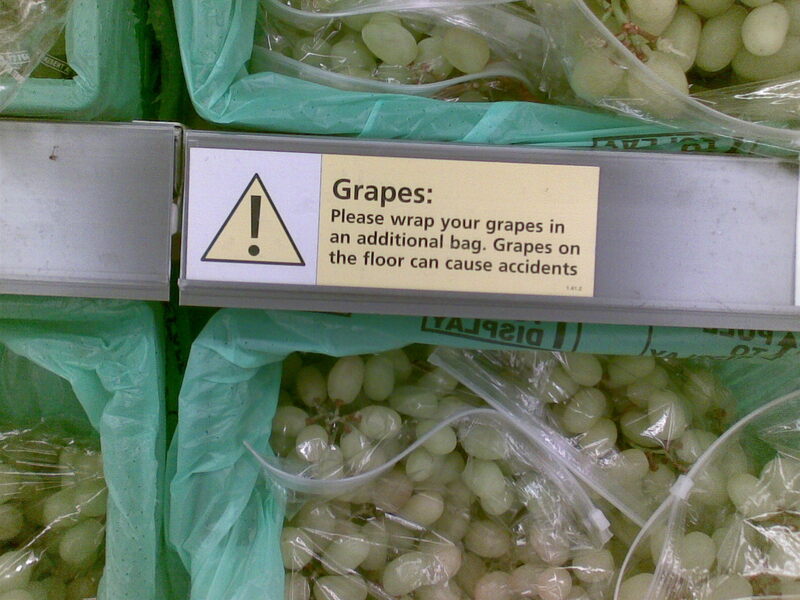 Grapes on the floor can cause accidents? I don't blame them - they've been ripped off a vine in some lovely warm country, lobbed in a ship and brought to Hull. If I was a grape and was free to roam I'd cause some chaos too. I currently have a 150g bag of sweets in my hands. The dietary advice tells me how much fat, carbohydrates, sugar, salt and saturates are in a "portion", which is 37g. Does anyone divide their bag of sweets into portions consisting of 24.7% of the full bag?